Corporate chieftains often claim that fixing the US economy requires signing new free trade deals, lowering government debt, and attracting lots of foreign investment. But a major new study has found that those things matter less than an economic driver that CEOs hate talking about: equality. In their study, Berg and coauthor Jonathan Ostry were less interested in looking at how to spark economic growth than how to sustain it. “Getting growth going is not that difficult; it’s keeping it going that is hard,” Berg explains. For example, the bailouts and stimulus pulled the US economy out of recession but haven’t been enough to fuel a steady recovery. Berg’s research suggests that sky-high income inequality in the United States could be partly to blame. 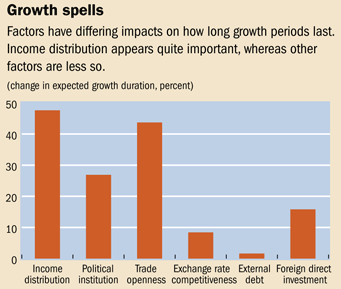 Many economists believe a similar process has unfolded over the past decade. Median wages grew too little over the past 30 years to drive the kind of spending necessary to sustain the consumer economy. Instead, increasingly exotic forms of credit filled the gap, as the wealthy offered the middle class alluring credit card deals and variable-interest subprime loans. This allowed rich investors to keep making money and everyone else to feel like they were keeping up—until the whole system imploded. 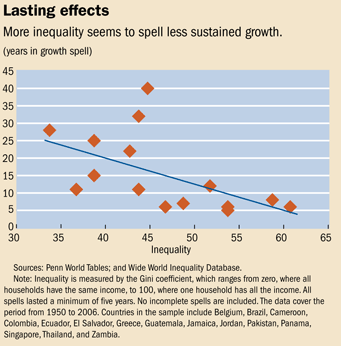 Income inequality has other economic downsides. Research suggests that unequal societies have a harder time getting their citizens to support government spending because they believe that it will only benefit elites. A population where many lack access to health care, education, and bank loans can’t contribute as much to the economy. And, of course, income inequality goes hand-in-hand with crippling political instability, as we’ve seen during the Arab Spring in Tunisia, Egypt, and Libya. Don’t miss our blockbuster collection of infographics: “It’s the Inequality, Stupid,” and our new, interactive explainer map of the Occupy Wall Street protests.